Relish Dating is the quickest way to connect with interesting new people. Open Relish Dating and see who's online at the same time. Anywhere from someone sitting next to you, to 250 miles away. No More computer match-making, No More waiting times, and No More searching through endless profiles. With a simplified search criteria, and FREE chat system, you can turn a conversation into an instant meet-up. 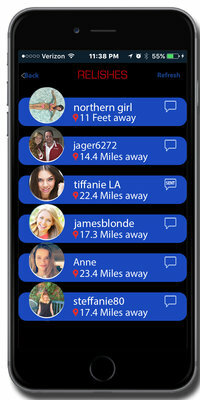 Relish Dating APP makes it easy, simple, and fun. It's up to you to keep it casual or take it to the next step. Wanna meet someone NOW? Download, sign up for FREE, open Relish Dating and see who's looking for you too! HAPPINESS IS CLOSER THAN YOU THINK! CHATTING AND SEE WHAT HAPPENS!